Painter, illustrator, lithographer, muralist and sculptor Hans Feibusch was born in Frankfurt, Germany. He served in the German army (1916–18) before studying medicine. He settled in Berlin in 1920 and studied painting under Carl Hoefer, won the Prix de Rome and travelled to Italy, then studied in Paris. He returned to Frankfurt and won the Prussian State Prize for Painting, arousing Nazi antagonism. His pictures were publicly burned and he was forbidden to paint. He emigrated to Britain in 1933 to be with his British fiancée Sidonie Gestetner. His work was included in the 1937 Entartete Kunst exhibition. In London his works were included in Artists against Fascism and War (1935) and the Exhibition of Twentieth Century German Art (1938). He was granted British citizenship in 1938. He was championed by the Bishop of Chichester, Dr Bell, who commissioned him to paint a chapel in Brighton. Many Church of England commissions followed including Chichester Cathedral and he became Britain’s most prolific muralist, publishing Mural Painting (1946). 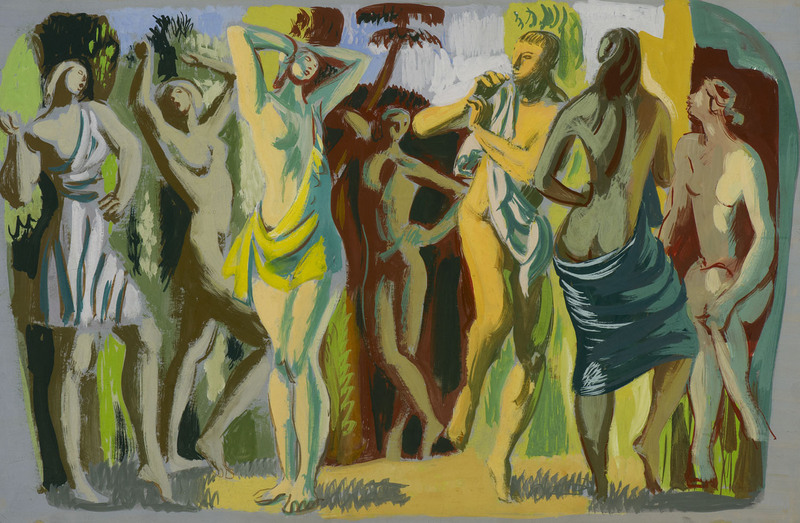 He featured in the 1951 Festival of Britain as a painter and muralist. He was forced to abandon painting after his eyesight began to fail in the 1970s and he took up sculpture. He exhibited widely including Lefevre Gallery (1934), with the London Group (member 1934), the Royal Academy (from 1944), the Ben Uri (1970) and Pallant House, Chichester (1995). His work is held in collections including London (Tate, Ben Uri) and Chichester (Pallant House).